Apparently these pregnant girls have all been drinking the same water!! We have had a ridiculous amount of girls from our church be pregnant at the same time and I have been to countless showers over the past few months and the showers won't be ending for a while. This picture was back from January at Bunco. 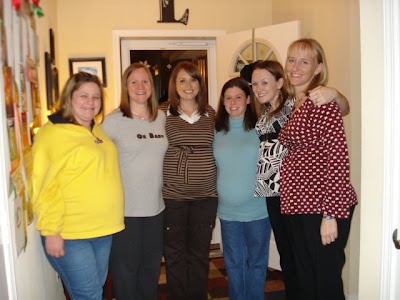 From left to right: Andrea (had Zachary a few days later), Shannon (due in June with Lydia), Mandy (due in a week and a half with Grady), Tiffany (had Christopher in February), Leigh (due end of May with Jordan), and Natalie (due in June with Isaiah). This picture was taken at Mandy's shower. 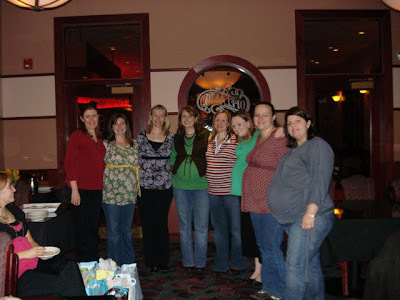 From left to right: Veronica (about 16 weeks pregnant in this pic with a boy), Leah (due in May with Asher), Natalie (with Isaiah), Mandy (with Graden (Grady)), Shannon (with Lydia), Leigh (with Jordan), one of Mandy's friends, Teresa (who had Henry about a week later). And this one was at Leah and Leigh's shower last Monday night. 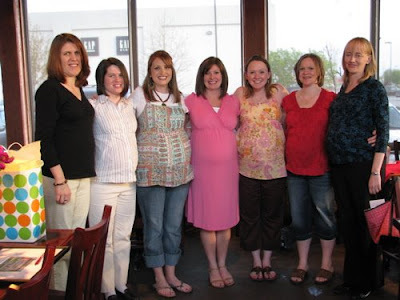 From left to right:Veronica, Katie (due in June), Mandy, Leah, Leigh, Shannon and Natalie. WOW...that is all I have to say. I have found out this past week that I have several friends who will be having babies in November as well. I am so glad to say that I will be able to hold all these babies soon and then give them right back to their mama's!!! Wow! I'll remember to have coke instead of water for a while....we have 16 in our class that are pregnant or trying! Crazy! I'm glad you had a great time in Eureka!